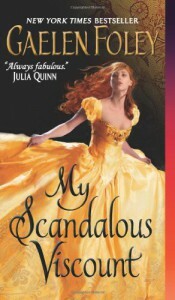 I went into My Scandalous Viscount feeling all excited for two reason, one being that it sounded like there would be epic heartbreak and tension and the second that it's a historical romance, and I was craving a good historical romance. I'm kinda sad to say it didn't really live up to my expectations. With Beau and Carissa already having been sniffing each other out for a while, I'd been expecting somewhat more sexual tension between them. And while it was there for a couple of pages in the beginning, after that it was pretty much over, at least in my opinion. They get engaged, married and well, it was kind of un-exciting. Beau falls for Carissa and she falls back in love with him and the two are just stupid enough not to admit this to the other. I was pretty annoyed that Carissa continued to doubt his sincerity when he gave her the most awesome wedding gifts EVER. I mean, seriously, they showed a lot of consideration and affection. Carissa fell just short of the category too-stupid-to-live, she has a little more sense than that, but she was just one of those girls that you couldn't get to but out of something, and while I sort of got that she wanted to be involved, I still thought she should have left it to the professionals. That's what they're for. Anyway, I mostly liked Beau, though I felt a bit of female indignation at the 'I'm your husband and therefore you must obey me' attitude he had going on at one point. Cavemen are not attractive in my opinion.